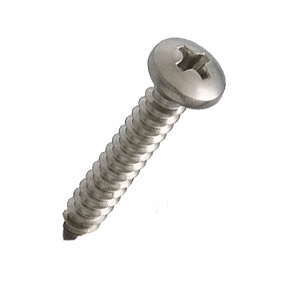 #8 X 1 inch Stainless Steel Pan Head Screw, A-Point, Phillips Drive Pan Head, 304 Stainless Steel. 1000/Box. Price/Box. Designed for general sheet metal work, tapping, attaching sheet metal to wood. Type-A sharp point provides fast penetration. 304 stainlesss steel for long term corrosion resistance. Point: Type A Sharp Point. Suitable for wood or light metal. Sizes: Available in #8 sizes from 3/8 to 3 inches, #10 sizes from 3/8 to 3 inches, #12 sizes from 1/2 to 3 inches, #14 sizes from 1/2 to 3 inches.